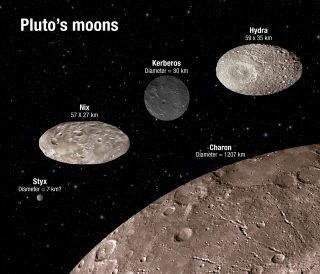 This illustration shows the scale and comparative brightness of Pluto’s four tiny moons, as observed by NASA's Hubble Space Telescope from 2005 through 2012. Pluto’s binary companion, Charon (discovered in 1978) is placed at the bottom for scale. The textures seen here are purely for illustration purposes. Scientists announced surprising discoveries about Pluto's moons, a spacecraft beamed home amazing images taken from a comet's surface, and the United Arab Emirates outlined its bold Mars plans. Here's a look at Space.com's top stories of the week. An affordable way to get astronauts to Mars?